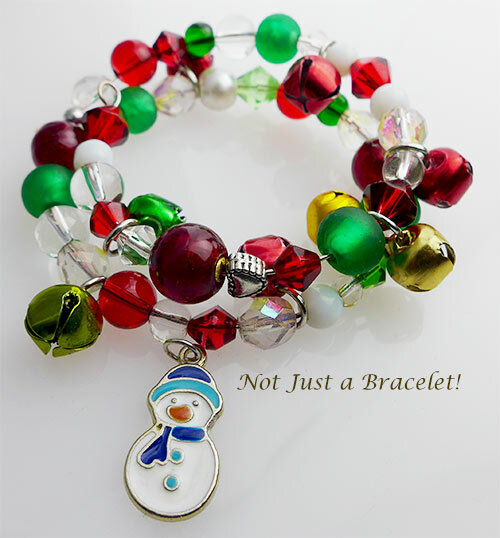 Late November we got a call at VenetianBeadShop from a Juvenile Detention Center asking if we could donate some beads for a Christmas program with about 10 girls. We were happy to do this. But…then the call to ask if we could come and show the girls how to make a piece of jewelry. Ok, that required some thought, now we are not only responsible for some beads but an entire piece of jewelry and show girls who may never have made jewelry how to make it. The piece had to be easy to put together, no wire wrapping, no knotting, something everyone could do and in a short time as well as something they could feel good about as a finished project (no small task). Then came the bureaucracy, rules: 1) A complete list of everything we were bringing 2) Drivers License and 3) Consent to a background check. There was no information provided other than the girls ranged from 13 to 18 and by early December the girls participating grew to 15. OK, making jewelry requires tools – will the tools be allowed inside JV? Finally we decided on a memory wire bracelet which we precut and would need only glue for the ends. But what beads would they want? Sorry to say, we decided to go more bling and less Venetian and we found ourselves in the aisles of craft stores a few times in the days leading up to the program with our investment growing daily. We wanted each girl to have the same components and by now we had decided to make 2 bracelets, one for the holidays and one for spring in aquas and blues and velvet bags to store them. Trial Run in our Bead Shop Kitchen! Not without a bit of anxiety, we headed off to JV – anxiety as to whether the girls would enjoy this program. The anxiety was needless. Arriving a few minutes before the scheduled time, we were informed that the girls were waiting on us and anxious to get started. There is a school room inside with tables ideal for the class. The counselors were impressive, though I am sure each day they go home needing a diversion – maybe beading?? Each girl introduced herself and told the group how she felt (a list of acceptable terms was handed to each girl). This was to help set the tone for the program and so the counselors would understand any behavior (I think). They were articulate and verbalized how they felt as well as why. They opened their kits and began working like Santa’s Elves. 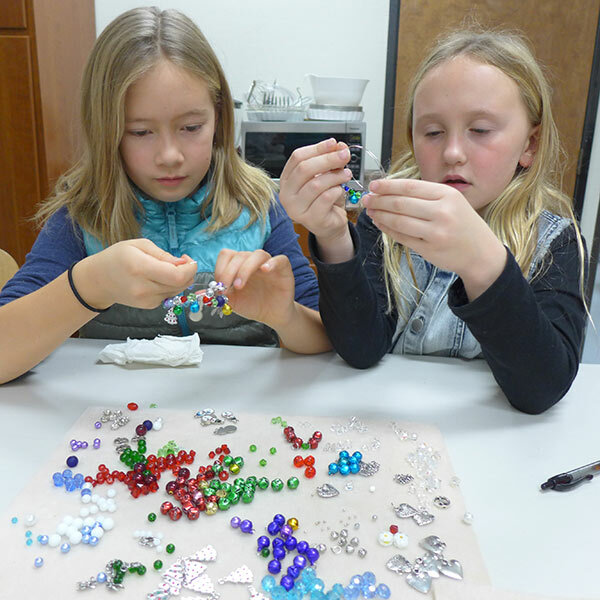 Each girl had a different approach, as those of you who teach beading know. 15 Girls and 15 different bracelets. Some opted for a single color and they swapped beads across the room and rummaged through the extra beads we carried. Unfortunately no cameras are allowed in the facility as the bracelets they made were beautiful, each one unique. And the bling factor was definitely a hit. As they worked we talked about how the beads are made, how all jewelry is made. 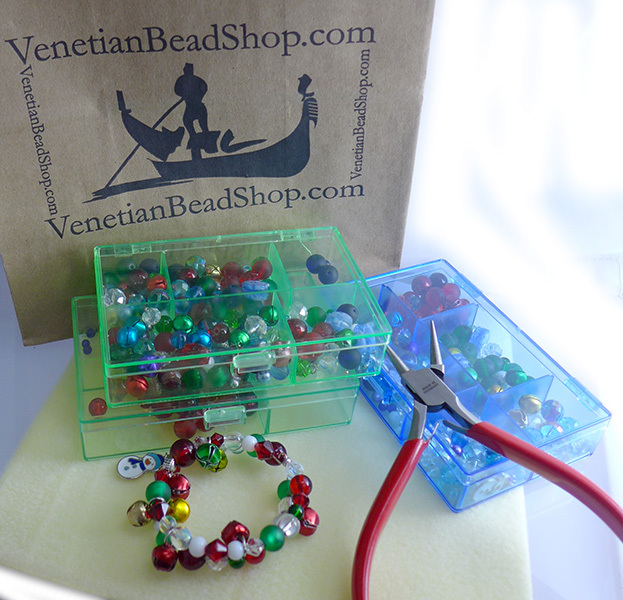 They were fascinated that many of VenetianBeadShop’s customers earn a living by making jewelry to sell and that our suppliers support their families in Italy by making beads. And that this is within their reach. At the end of the program, the girls went around the room again describing how they felt while making the bracelets and for whom they made them. It was clear from their words that the diversion from hours of boredom was welcomed. It gave them some time away from the problems of their troubled lives. Some were made for family members, even if those same family members had not been to visit. And they were happy to have gifts they could give, after all they can’t go shopping. They were unanimous that they would like to make more jewelry. This time, we got our turn to say how we felt: amazed at their resilience, at their ability to create and HAPPY to have spent time with them. ← How to Blow Your Own Beads! Awesome!! Thanks so much for doing this. Whoever invited you had a great idea. I would like to learn beading also. Trudy, we have many free designs on our site and some helpful hints. But you can find a beading class in almost every community center to learn the basics. And your local bead shop will have classes as well. Just stringing on a memory wire is what we did with the girls. Thanks for your comment.